Exercise is good, right? Whether you are an Olympic athlete, a weekend warrior, or just a casual walker, exercise has been shown to have all sorts of beneficial effects on our health and well-being. (Need convincing? Check out here, here, and here!). One of the biggest ways that stress can impact our performance is when it takes us out of the game--when we sustain an injury. Injuries can take away all of these positive effects, causing physical, psychological, and even financial harm. And there’s more: researchers have found that there are psychological and social causes of injury, too. Stress, certain personality characteristics, and poorly developed coping abilities have all been shown to contribute to an increased risk of injury. These two components—perception and response—make up our immediate response to any given situation. 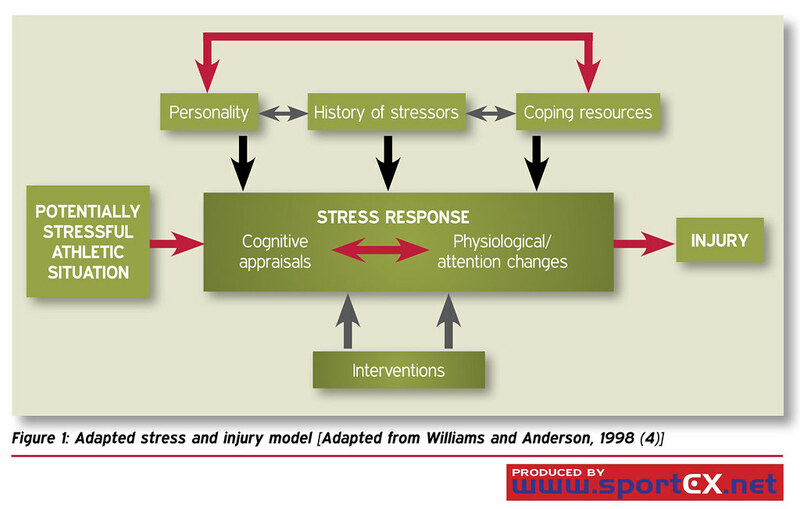 The boxes above and below also exert an effect on the stress response. In our last blog, we talked about two of these factors: stressors and interventions. Stressors include the major life events, daily hassles, and even past injury history; things that weigh on one’s mind and distract from the task at hand. The cognitive, somatic, and other relaxation exercises are just a few interventions that can assist with reducing stress levels. Personality and coping resources make up the rest of the model. Through research, we know that personality traits like anxiety, anger, dominance, and competitiveness have all been linked to heightened injury risk. These personality traits may serve as distractors to performance or they may cause an athlete to put their body in more risky situations. Rather than view these traits as negatives, it is important that we recognize our own personality traits and keep them in mind as we are participating in exercise or sport. Finally, coping resources come into play; these factors include mental skills, stress management, and social support. For anyone undergoing stress, it is important to have a support system—someone to chat with or a teammate to work through problems with. You don’t always have to deal with stress on your own! Injuries aren’t the only way that stress can inhibit performance. While they are a problem for athletes and exercisers, they may not be the biggest problem for stress at work or school. Next time, we’ll talk more about some other ways that stress impacts our performance!